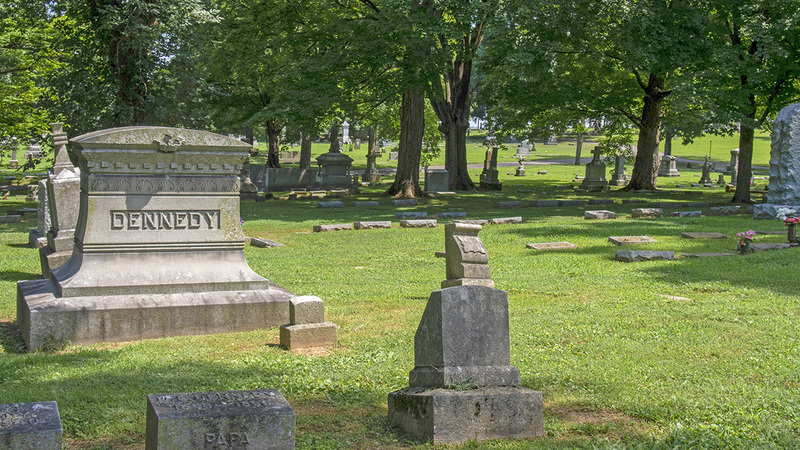 This 47-acre cemetery was dedicated on November 29, 1868. 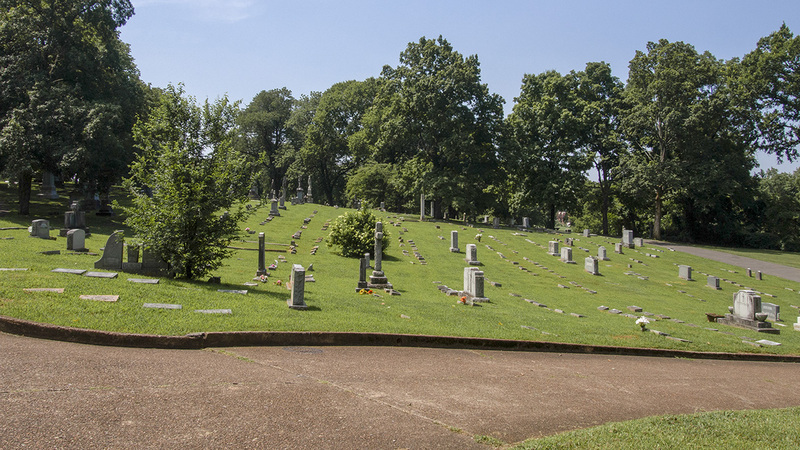 Located less than two miles from downtown Nashville, it is the city’s sole Catholic cemetery and is owned and operated by the Roman Catholic Diocese of Nashville. 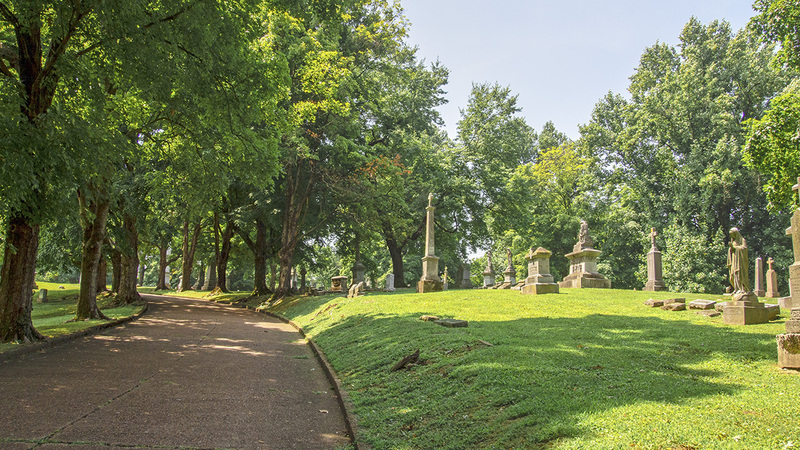 From the cemetery’s opening to 1901, the remains of hundreds of people were reinterred here (mostly, but not entirely, occupying Section C in the north) from a six-acre plot within the Nashville City Cemetery. 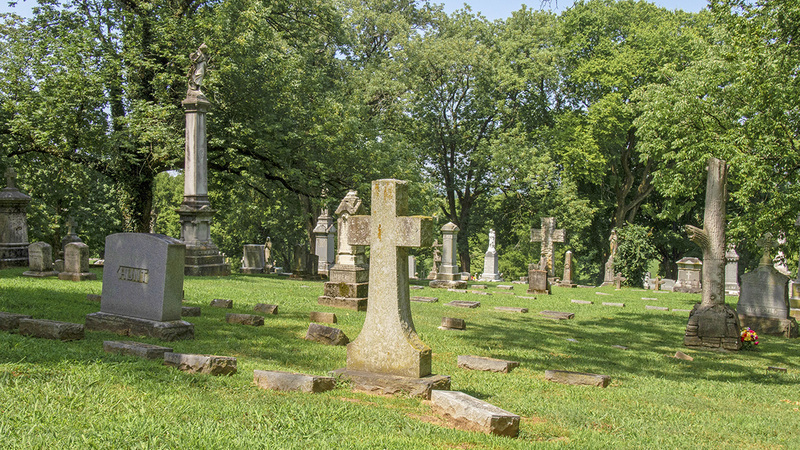 The cemetery is situated on a gently rolling landscape that is punctuated by large oak trees and a wide variety of grave markers, including ornate angelic statuary, obelisks, and simple rectangular gravestones. 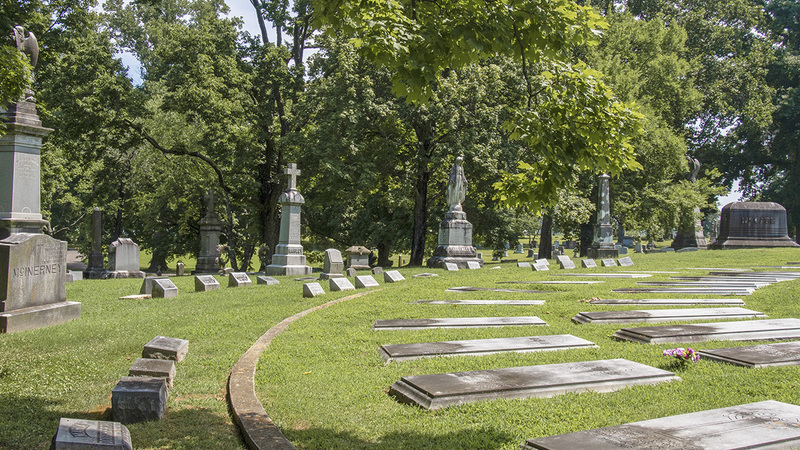 The gravestones are aligned in uniform rows within each of the cemetery’s sections, which are divided by connected, meandering pathways that occasionally form loops. 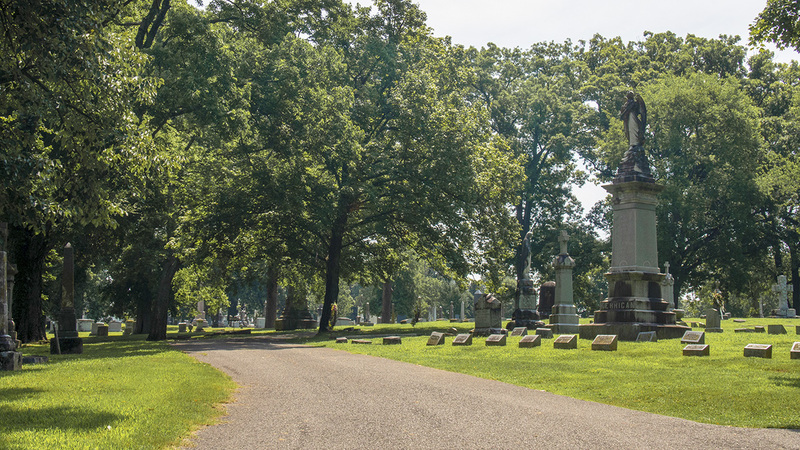 The curving paths and resulting irregular burial sections are located in the northern half of the cemetery, while the southern half is defined by rectilinear pathways, the result of the cemetery expanding over time. 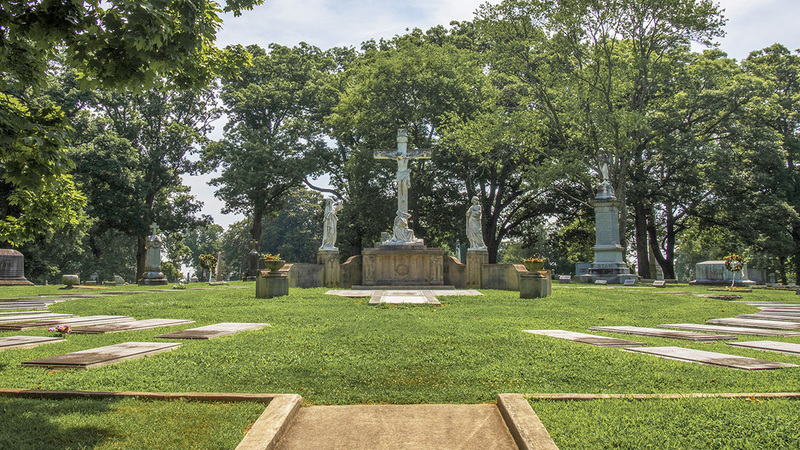 Near the eastern edge of the site is Priests Circle, where a statue of the crucifixion is encircled by large, flat tombstones in a burial area reserved for clergy. 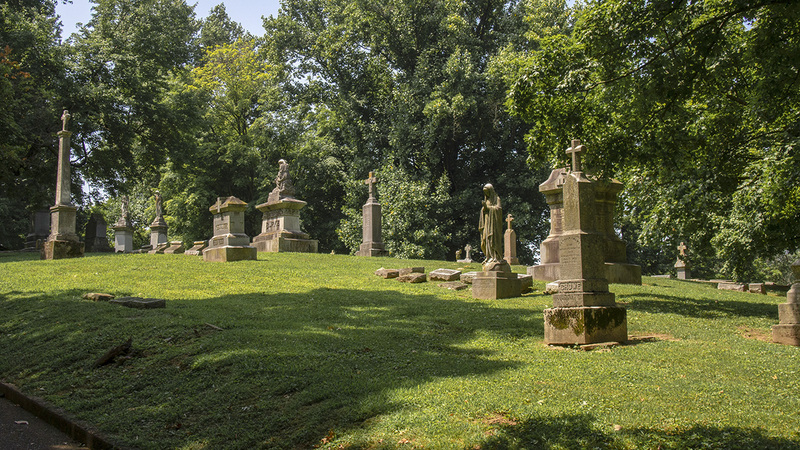 The site is seamlessly contiguous with Mount Olivet Cemetery to the east, the division marked only along its northern boundary by the pronounced transition from Calvary’s Gothic stone wall to Mount Olivet’s wall. The remainder of the perimeter is traced by a low hedge. The cemetery is entered from the Lebanon Pike to the north, where dual Gothic-style gatehouses (one of which is sealed) built in the early 1930s frame a double wrought-iron gate.